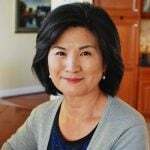 As a small child in Korea, I grew up on eggs served with rice. We all did! A fried egg mixed with warm steamed rice and a little bit of soy sauce and sesame oil was so delicious. We also had countless lunch boxes with a fried egg on top of the rice, gyeran mari (rolled omelette) or gyeranjjim (steamed eggs). 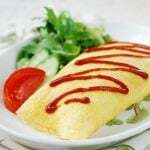 Eggs are still a big part of Korean cuisine. 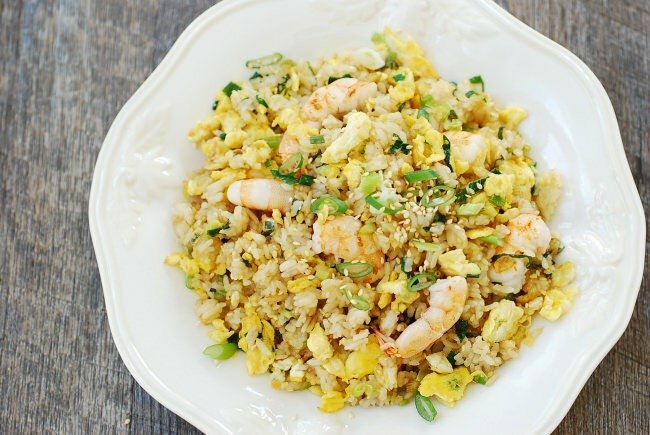 This egg fried rice is flavored with lots of scallions! 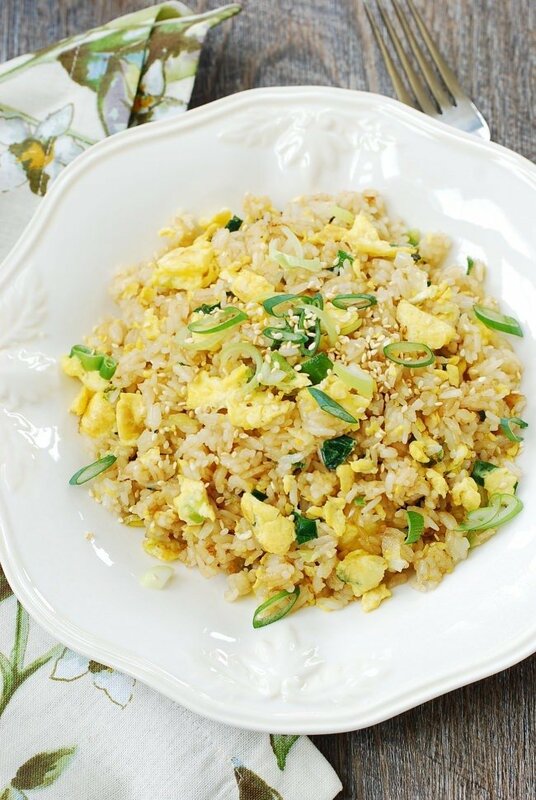 It’s a quick and easy way to whip up a light meal and use up leftover rice and eggs. If you want to add any other protein such as shrimp, chicken, beef, etc. 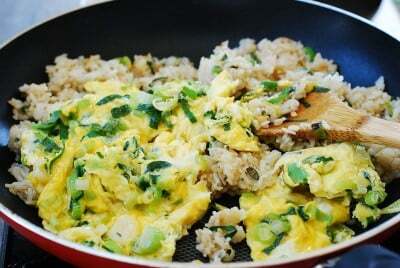 to the fried rice, separately cook them and combine with the rice and eggs at the end. 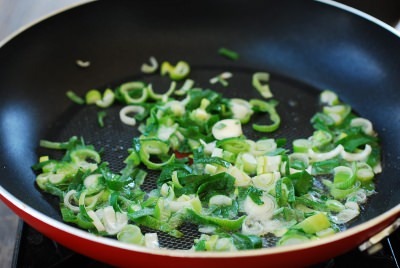 You can also fry frozen peas or finely chopped carrots with the rice. I added some shrimp in the photo below. As you probably know, the secret to good fried rice is day old rice. If the rice is a bit too hard after being in the fridge, heat it up in the microwave to soften it a little, and break it up if clumped up before frying. If you need to make fresh rice for it, make it slightly drier by using a little less water than usual, fluff it up, and then leave it out to cool and dry out a bit. 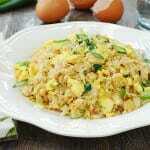 This egg fried rice is simply delicious! 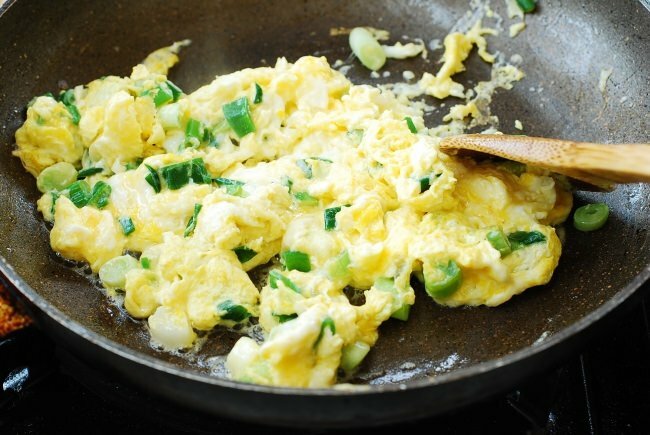 Also, the scallion scrambled eggs are great on their own as breakfast or as a quick side dish to any Korean meal. 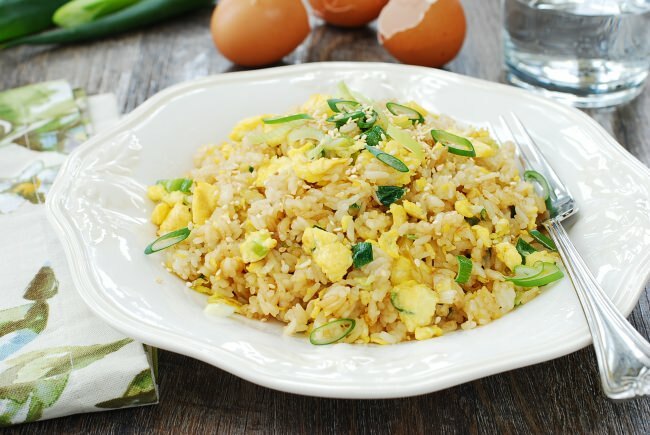 A simple fried rice made with eggs and scallions! Turn the heat up to medium high. 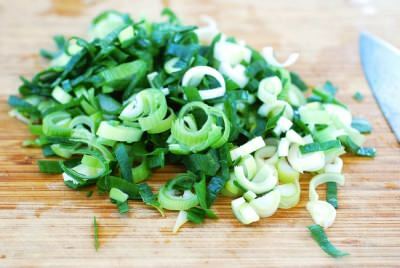 Add 2 tablespoons of oil, and stir in the remaining scallions until the scallions turn soft and fragrant. 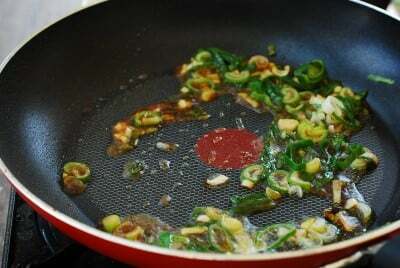 Stir in 1 tablespoon of soy sauce. 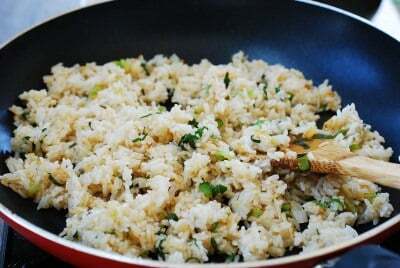 Add the rice, and fry the rice, stirring well and breaking up the clumped up rice, until well toasted. 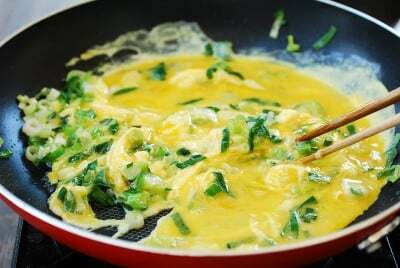 Return the eggs to the pan and mix well with the rice, breaking up the eggs. Add salt and pepper to taste, sesame oil, and sesame seeds. Thanks a lot for your recipes. I’ve just discovered your blog last weekend and yesterday I’ve made my first DakJuk following your recipe. It was delicious! May be not quite as authentic as what I used to get for breakfast in Seoul and Okpo, but perfect for me. 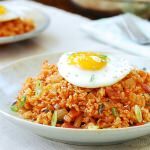 Unfortunately, most of Korean dishes are a bit too spicy for my liking, but these egg fried rice I will definitely try as well. Welcome, Liza! I’m glad you’ve found my blog. 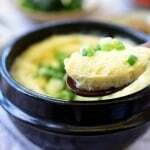 There are many Korean dishes that are mild. 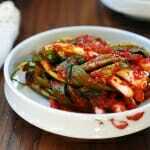 Hope you find many recipes to try on my blog. Thank you so much for visiting and leaving me comments! It means a lot to me. 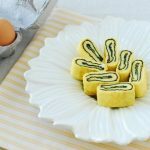 I would love to see how you make your myulchibokeum (멸치볶음). Do you use the tiny myulchi? What kind of nuts do you use? 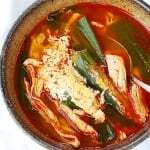 🙂 I love Myulchibokeum, and back home (in Korea) there were 2 ways we had it. 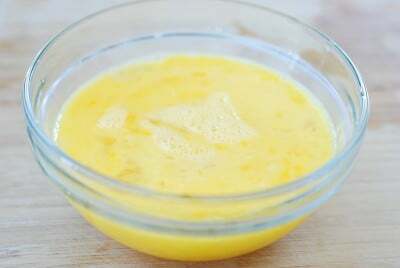 I am sure you have your go-to recipe! Please share! 🙂 Thanks again. Your masterpiece is so beautiful, Hyosun.